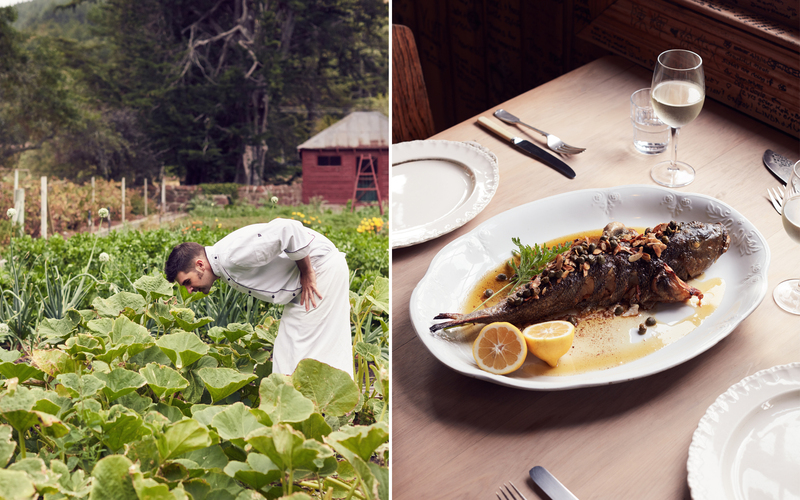 On the South Island of New Zealand, just about anything grows—and a group of inspired chefs and winemakers are turning the fruit of the land into a distinctive national cuisine. 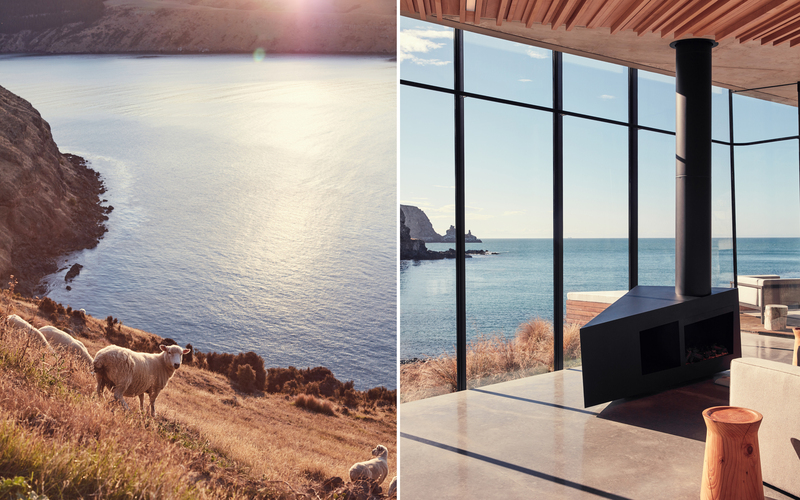 It was getting on toward sunset at Annandale, a 4,000-acre sheep and cattle farm turned luxury lodge on the Banks Peninsula, a slightly flattened asterisk of land southeast of Christchurch, New Zealand. The light had turned rich and golden, and the twin newborn lambs dozing 0n the gravel road glowed like movie idols. Annandale’s director of hospitality, Callum Farnell, slowed the SUV to a crawl until they got the picture. They wobbled to their feet and then, all of a sudden alert and quick, dashed away, their legs clacking like a marionette’s. Annandale dates to the heroic age of sheep farming, and the current owner, a rich Kiwi who made his fortune in the U.S. in real estate development, has kept the property’s original gravel roads to “maintain the farm character,” Farnell told me. But he also laid fiber-optic cables for high-speed Internet and spent untold sums on every other amenity that would foster Annandale’s atmosphere of privileged isolation. The Shepherd’s Cottage, which really was a hired man’s house in the day, is the most “primitive” of the property’s four lodgings, although its restoration using farm-cut macrocarpa wood achieves a result that is rustic only by Annandale standards. Two additional villas—a modern glass pavilion and a low-slung cedar beach house—sit on private coves that shelter rare Hector’s dolphins and offer views of an offshore aquaculture farm where Annandale gets its green-lipped mussels. The main house, the Homestead, is surrounded by gorgeous vegetable gardens. 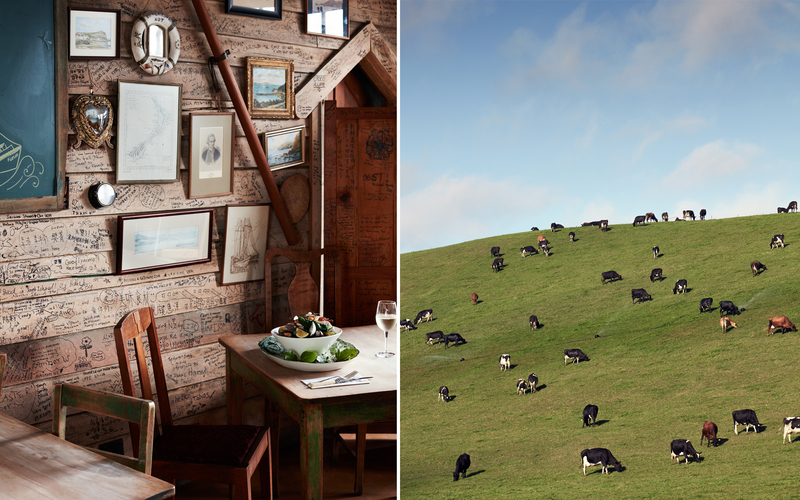 Most of what Annandale guests eat comes from the property or has been sourced locally—a distinct advantage thanks to the South Island’s rich agricultural history. Farnell got me to the cottage as the sun dropped below the horizon. He went inside to light the fire, and I stayed out to study how the raw land dropped with tectonic grandeur into the ocean’s void, a landscape that reminded me of Scotland’s Outer Hebrides or the wildest stretches of California’s Central Coast. A minute later he called me in to explain that the fridge had been stocked with the fixings for a three-course dinner: seared scallops on an herb salad garnished with edible flowers, a braised saddle of farm-raised beef with roasted root vegetables from the garden, chocolate mousse. (A printed card gave instructions for how to heat and assemble the ingredients.) Then he left me alone for an evening of fireside rusticity and Spotify. The next morning, after crumpets with homemade jam—Kiwis put up exceptional preserves—I walked the pastures to count sheep and returned for a soak in the outdoor tub before Farnell came to collect me at midday. He was the only person I’d seen since he dropped me off. It was, however, definitely for me. Guest rating: awesome. And all the more so because of Annandale’s ardent farm-to-table program. Whereas a decade ago in New Zealand I might have encountered mostly European-leaning “resort-fancy” cooking, Annandale’s simple, honest, and intensely local meals perfectly set the tone for a weeklong trip to investigate the distinctive food culture that has taken root on the South Island, New Zealand’s larger, less tropical, and less populous portion. Auckland, on the North Island, is the country’s fine-dining hub, but South Island is arguably the origin of a national cuisine. My leisurely route south from Christchurch, which is still recovering from a massive earthquake in 2011, to Queenstown in the Southern Alps, took me through a world of dramatic scenery, past multiple vineyards, olive groves, stone-fruit orchards, and a grazing hinterland that supplies much of the country’s world-famous lamb and venison. With this agricultural wealth as its underpinning, modern Kiwi cuisine builds on 19th-century Anglo-Irish cookery and enlarges the traditional pantry with ingredients from Europe (olive oil, truffles, saffron), Asia (coconut milk and lemongrass), and even Latin America (chiles and avocados), much of which the country now grows itself. The distinctive food and wine culture I found is vibrant—at once deeply rooted and globally attuned—and unexpectedly provided a glimpse of how the country has been shaped equally by its isolation and its transoceanic ties. It’s difficult to put your finger on what makes Fleurs Place such a draw. There’s the setting, of course, and the spectacular simplicity of the menu, which includes vast platters of local fish with unfamiliar names (moki, tarakihi), stews of green-lipped mussels and bright yellow scallops, old-fashioned preparations like potted eel, and nowhere-else ingredients such as muttonbird, a wild seabird. The eccentric dining room could be a hermit’s cottage, except that the wallboards are graffitied up to about eight feet high with signatures, drawings, notes, and love letters left by guests. From its food and décor to the music played by a local guitarist during lunch, everything about Fleurs Place has an air of improvisational genius. People come because there’s no other place like it. Which is really another way to say that Sullivan herself is one of a kind. 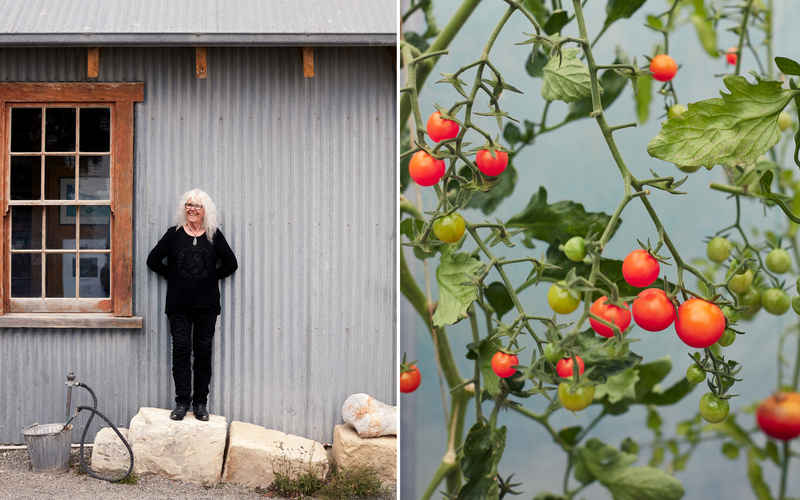 “When I came to Moeraki fifteen years ago, I didn’t mean to make another restaurant,” she told me after lunch. She backtracked to explain that she had already sold Olivers—the restaurant that helped make her name—in the former mining town of Clyde, an hour from Queenstown, and had come to Moeraki to recover from chemotherapy. Out on a fisherman’s boat one day, she watched the crew toss overboard the scraps from cleaned fish, and she lamented the waste of good bones. “I thought, ‘I could make fish stock with that,’ ” Sullivan recalled from behind thick black glasses that contrasted stylishly with her shag of white hair. “I’ve always done food of the region. That’s been my claim to fame.” She started selling fish chowder out of a trailer—New Zealand’s original food truck—and success sort of backed her into doing a restaurant. She claims that it doesn’t actually have a name. Sullivan’s influence ricocheted down through the years and landed, most notably, at Roots, a tiny spot in Lyttelton run by young Chilean chef Giulio Sturla and his American wife, Christy. I had stopped for lunch on my way to Annandale because I’d read that Roots had recently been named New Zealand’s Restaurant of the Year. The bare-bones dining room was like the culmination of Sullivan’s locavore journey, but certain culinary markers—of René Redzepi’s heightened sensibilities, of Sturla’s global vision—pointed toward a new destination. On the day I visited, an Asian-y whiff lingered around the menu, as if Sturla had recently come back from Tokyo or Seoul with a suitcase full of ingredients; more recent menus lay a Latin foundation of tacos and ceviches. My five-course lunch, all served on hand-thrown pottery, included hapuku fish in foamy saffron broth, pumpkin gnocchi splashed with dashi, pork rillettes flecked with black garlic, and foraged greens sprouting from every dish, including dessert. I had all local wines, of course. The meal perfectly caught the spirit of modern cooking right now—I almost could have been back home in Los Angeles. After my meal at Fleurs Place, I turned inland from the coast and drove through the high grazing country of Central Otago to Clyde, where Sullivan had found her culinary voice. The region is vaguely analogous to the American West—wide open, sparsely populated, rugged, beautiful, historically shaped by ranching life—and the four-season climate favors stone fruit of every description, berries, apples, nuts, and grapes. The original homesteaders survived on whatever they could raise or hunt, and when Sullivan moved to Clyde in 1977, the local fare was boringly straightforward—everything was served with fries and coleslaw. What she knew about restaurants was the French cooking she had learned in the go-go days of 1970s Queenstown. Somehow out of this combination of influences she invented a rabbit, venison, and pickled-walnut pie at Olivers. It was a turning point because it ignored the rules of fancy restaurant cooking—everything imported was better, especially if from France—in favor of the homegrown, the seasonal, the locally sourced. Olivers today is less tumbledown than in Sullivan’s time, thanks to investment from the new owners, a second-career New Zealand couple. 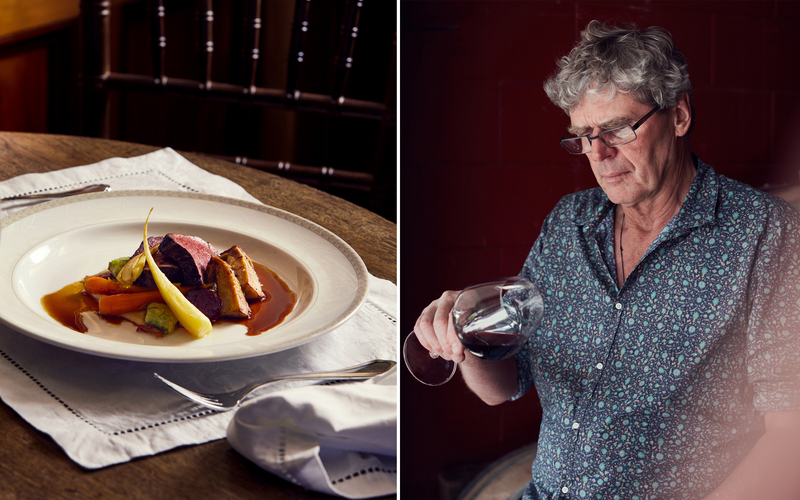 But the food, by chef Michael Coughlin, still bears the stamp of the region: duck-liver pâté with a jelly of crab apple and quince, roast lamb rump with ratatouille jam. The wine list demonstrated the range of Central Otago’s cool-climate vineyards, which produce refined bubblies, aromatic whites, and elegant Pinot Noirs. An hour up the road from Clyde into a high-altitude subregion called Gibbston, Amisfield winery illustrated Ritchie’s point about foreign money: an American co-owner came aboard in 2013. Amisfield occupies a high-style minimalist building with a busy “cellar door,” or tasting room, and a notable restaurant, Amisfield Bistro. Chef Vaughan Mabee’s kitchen sent out robust, photogenic food, such as a whole roasted cauliflower served on a board like a haunch of venison and actual venison baked into a pâte brisée garnished with South Island black truffles. Amisfield Bistro was expensive and glamorous, a setting for the Queenstown Beautiful People to show themselves when they’re bored with heli-skiing. Despite the jet-set atmosphere, I learned at the cellar door that only tiny quantities of Amisfield’s Pinot Noirs and dry Rieslings ever make the trip to the U.S.—a fact that holds true of most South Island wines, other than the large-scale commercial Sauvignon Blancs produced at the very northern tip. option. Plonk gradually gave way to quality. The fact that Central Otago winemakers were not trying to make opulent “international-style” wines to appeal to the mighty American critic Robert Parker gave them permission to root deeply into the local terroir. Perhaps nowhere else in the world does “sense of place” come with such a beautiful setting as at Rippon, in Wanaka, another lakeside town that serves as a jumping-off point for the Southern Alps. The winery was established in 1975 by Rolfe and Lois Mills, parents of the current winemaker, and its 136 acres are farmed according to biodynamic principles that combine rigorous organic-farming methods with more esoteric ideas. He talked about how the glass of high-end Tinker’s Field Pinot Noir in front of us came from vines grown on their own roots. How they were cultivated with no fertilizers and no pesticides and how the grapes were picked by hand. How Rippon, whenever possible, doesn’t filter or fine its wines. Whatever one makes of all that, the resulting wine tasted as elemental as water and left me with an elated feeling of rootedness and well-being. Maybe it was just the giddy scenery. At the very least, Rippon’s idealistic approach was the diametrical opposite of mass-scale production. The wines are essentially unobtainable in the States. At that point in my week on the South Island, I had only one real question left, the most basic one: How, especially given its dismal postwar starting point, had the food culture evolved as it had? Grant Taylor laughingly told me that while he was growing up, in the 1960s, the food in New Zealand “was as bad as anything you got in England.” He put the improvement down to two facts: an influx of global tourists and the “overseas experience,” a Wanderjahr taken by most young Kiwis. They return home inoculated with ideas from abroad. The interesting twist is that rather than simply import French or Italian or Japanese influences, younger generations of chefs have been inspired to look inward for their culinary identity. Grant’s friend Jeremaia Fisk, a wilderness guide who at the time was managing Kinross Cottages near Valli, put it best. A couple of days later, I was back near the Banks Peninsula for drinks and dinner with Miles Refo, co-owner with his partner, Hall Cannon, of Otahuna Lodge. In Otahuna’s paneled entrance hall, meticulously restored since the earthquake, Refo picked up on Fisk’s theme unprompted. He said that New Zealand is not a manufacturing country, so almost all its consumer goods have to be imported. But food is the economy’s strength and, being self-produced, has been a ready medium for Kiwi identity, stretching equally into the country’s past and outward toward the world. As Refo and I talked, Otahuna chef Jimmy McIntyre laid out salumi made from the estate’s heritage Wessex Saddleback pigs, pickled pears, and zucchini relish from the garden. Dinner included crayfish and warehou from nearby waters, winter vegetables and mushrooms from the property, and duck raised by a woman down the road. Even the saffron was locally grown. There were also the by-now-familiar touches of the antipodean exotic: chipotles, avocados, coconut milk. logic of 21st-century globalization, the flat-world economy. New Zealand’s South Island reminded me that the world is, in fact, still round, and if you want to drink Rippon in the Southern Alps or eat blue cod at Fleurs Place in Moeraki, you still have to fly halfway around it to get there. And that, in and of itself, is a fine argument for making the trip. Annandale: A secluded sheep and cattle farm with a collection of four luxurious villas and innovative farm-to-table cuisine. Pigeon Bay; doubles from $488. Kinross Cottages: Simple and tasteful accommodations on a vineyard that also has a popular wine bar. Queenstown; doubles from $155. Otahuna Lodge: This classic South Island lodge has been beautifully restored since the 2011 earthquake and serves an excellent menu in its ornate dining room. Christchurch; doubles from $832, including dinner. Fleurs Place: Fleur Sullivan, the godmother of modern Kiwi cooking, draws diners from all over to her marvelously ramshackle seaside spot in Moeraki. Entrées $24–$28. Harlequin Public House: Part bistro, part London pub, this is the place for platters of oysters, homey comfort food, and a great list of New Zealand wines. Christchurch; entrées $15–$38. Olivers: An early culinary pioneer in the town of Clyde that still serves some of the best food around. Entrées $12–$27. Rata: Enjoy a glass of local wine in the sunny courtyard of this Queenstown hot spot before indulging in its award-winning cuisine. Entrées $25–$29. Riverstone Kitchen: A prime stop near Moeraki where many ingredients are grown on the chef’svfamily farm. The menu includes dishes like fennel risotto, Thai red curry, and pear tarte Tatin. Entrées $22–$24. Roots: A critically acclaimed bare-bones spot that offers multiple globally influenced tasting menus. 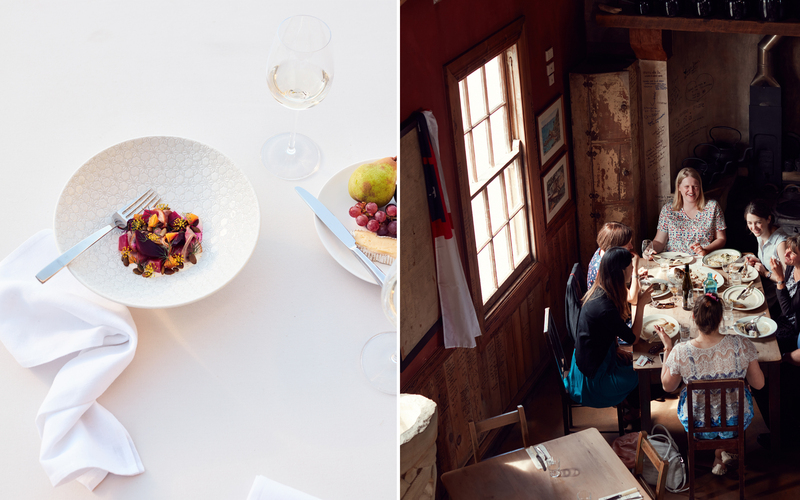 Lyttelton; tastingmenus from $62. Saffron: The ever-changing menu at this local favorite in historic Arrowtown takes inspiration from Eastern and Western cuisines. Entrées $11–$20. Amisfield: A sleek winery with a busy tasting room and a notable restaurant in Gibbston Valley. Queenstown. Mt. Difficulty: This tasting room in Bannockburn offers terrific examples of Central Otago Pinot Noir, including some older vintages. If you’d like to stay for lunch, be sure to make a reservation. Quartz Reef: A must-stop in downtown Cromwell for Rudi Bauer’s refined, biodynamically produced wines. Rippon: A biodynamic operation in Wanaka providing wines that are hard to find outside of New Zealand. Valli: Schedule a visit at Gibbston Valley legend Grant Taylor’s vineyard and taste his lauded Pinot Noir. Gibbston. Aoraki/Mount Cook National Park: The scenery here is epic, even by New Zealand’s very high standards. Butler’s Berry Farm:This café and farm is an excellent place to buy local strawberry, currant, and raspberry jams. Makikihi. Oamaru’s Victorian Precinct: Exports of New Zealand lamb made Oamaru rich in the late 19th century. Now visitors can marvel at the well-preserved stone architecture and a number of bookstores and other small shops.